Stonegate was inspired by Gothic gatehouses found on castle grounds in the United Kingdom. This charming little castle-like structure is available now and is ideal for display on a desk or side table. Stonegate features a quartet of tiny rooms, plus tower, ready to build out, decorate and furnish with half-scale treasures. A hand painted faux stone exterior cloaks the mystery of its fairy tale interior, an unwritten story waiting to unfold. Four removable pieces give access to the interior. This piece is the perfect starter size for a new miniature collector, hobbyist, or anyone who wishes to accessorize with decorative, architectural miniatures. Finished exterior; unfinished interior. Interior finishing is available. Please write for more information. Dimensions: 11" x 14" base, 20" high; 1:24 scale. 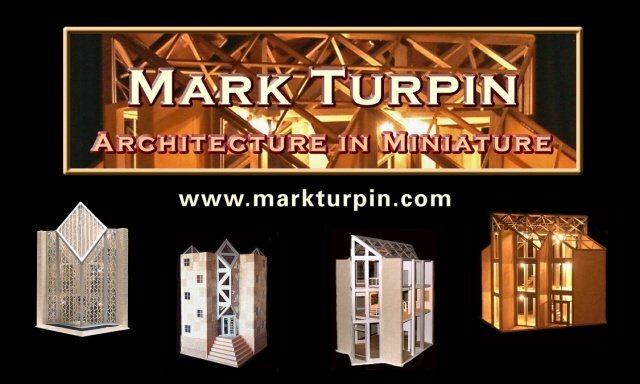 For more information, email: mail@markturpin.com.